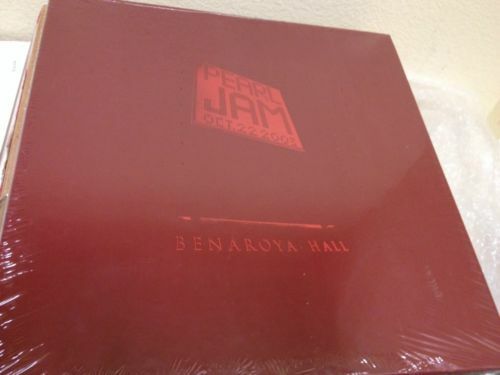 NOTES: This is an auction for Pearl Jam'sLive At Benaroya Hall4 LP box set. The records were pressed on 180 gram red vinyl and were limited to a pressing of 2,000 copies that sold out within 48 hours on the album's original release date in 2004. The records were not available anywhere commercially; they were only available for sale to members of the Ten Club, Pearl Jam's official fan club. The records are still in the original factory shrink wrap; they have not been played. The outer box has some shelf wear evident on it. There is a slight tear on the left side of the back cover where the number was hand written on it (this is norm). The shrink wrap is torn only in that place and is otherwise intact. Each copy of this album was hand numbered out of 2,000; this set is #1,777. Excellent Christmas gift for the Pearl Jam fan. Sorry, US BIDDERS ONLY. SHIPPING WITHIN THE US CONTINENTAL STATES ONLY - FREE VIA USPS PRIORITY MAIL W/TRACKING NUMBER. PLEASE ALLOW 2 BUSINESS DAYS FOR HANDLING. USUALLY GOES OUT SAME DAY BUT MAY NEED 2 IN SOME CASES.